P.M.P. 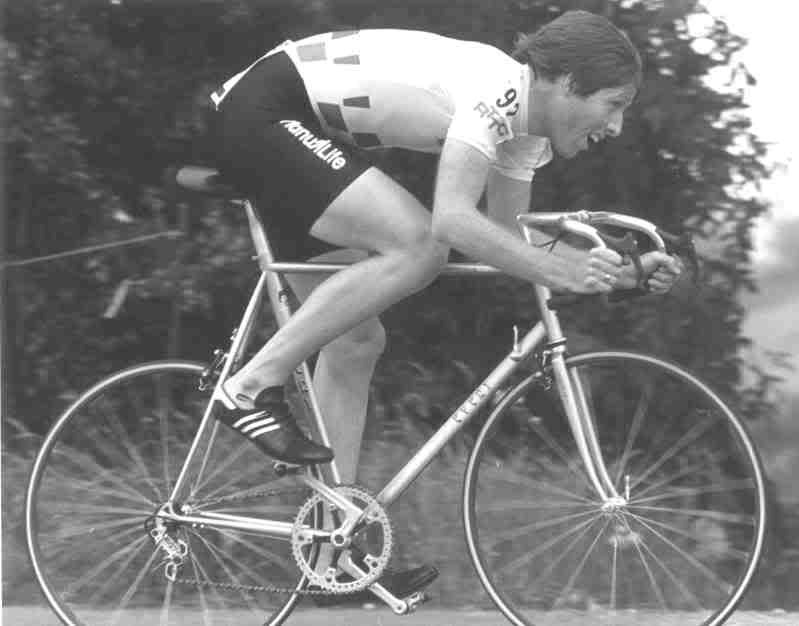 "L" or "bent" cranks of the early 1980's may be one of the most famous bad ideas in cycling. Note the arm length is clearly stamped "175", indicating somebody at P.M.P. understood it was simply an odd way to make a 175mm crank. The unique form of the P.M.P. pedal crank means improved distribution of the energy required in pedaling and a perfectly round stroke; the result: increased equalibrium. Its L-shaped design increases the pedal's propulsion power and lessens energy disperion on the downstroke. Pedaling the P.M.P. 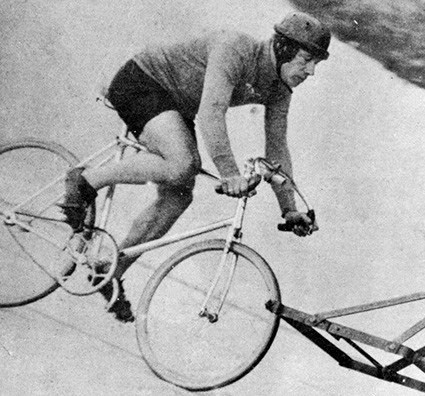 way means to be perfectly in the saddle; in fact, the bicycle rider is forced to lean back slightly more than usual, putting him in the best possible aerodynamic position. The P.M.P. pedal crank means that pedaling is no longer an "ankle game" since the bottom dead-point is lightened to allow greater ease on the upstroke. Bicycling becomes a pleasure and not a chore because the P.M.P. pedal crank and its unique features take eaway the exertion and lighten muscle strain. The P.M.P. 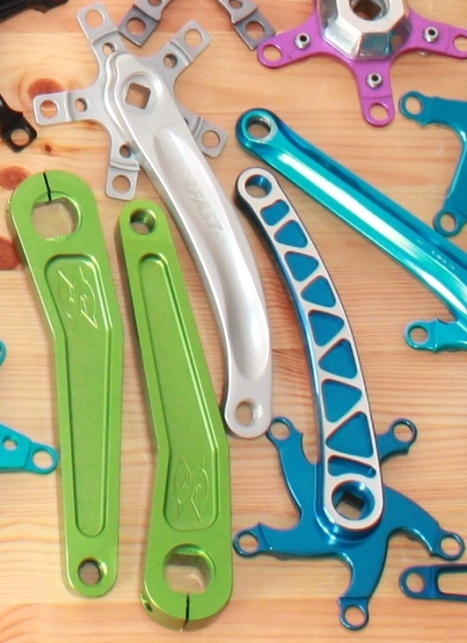 pedal crank has taken its place on the market after extensive testing by professional cyclists who demand the maximum performance with the minimum strain. 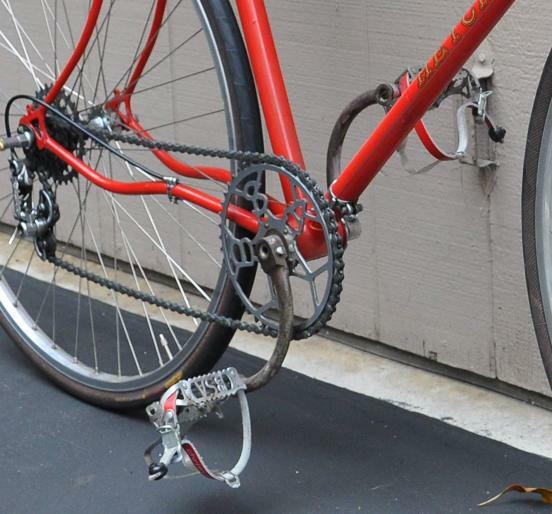 This pedal crank is a high quality product that you can rely on. Wholesale price, $140.00; 5 or more, $135.00 each. 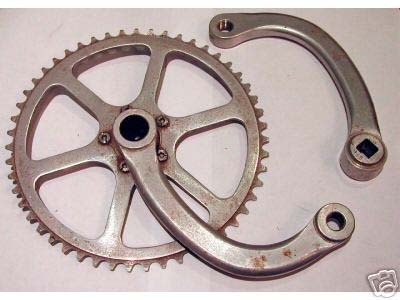 A moment's thought shows a straight crank and an L crank always have the same relation between pedals, chain, and bottom bracket. Thus, there is no advantage to L cranks. And an L crank always has more material than a straight crank, so is always at a disadvantage for weight, strength, stiffness, and/or cost. That said, enough of these sold they still appear from time to time. It is unclear how many buyers believed the hype, and how many simply wanted them for their humor or art value. The P.M.P. 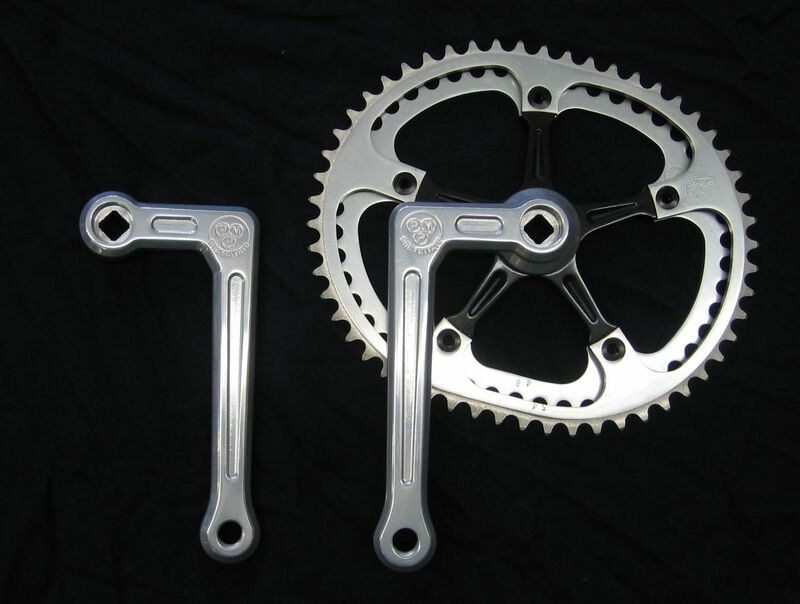 cranks have a spider bolted to the right crank, with the square taper formed from both pieces. The square taper is loaded heavily, and making it in pieces, especially with a few light bolts to hold them together, is likely to increase loads greatly and thus lead to premature failures. So it may be unwise to ride these, even for art or humor value. 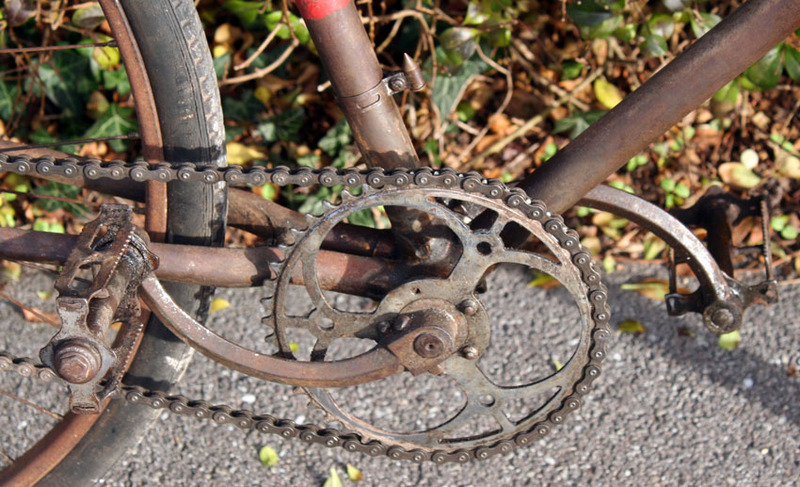 Chandez L cranks, made by Chalaye of St.Etienne, are fitted on a 1950 Hetchins, shown at http://peterbrueggeman.com/cr/nulli.htm as of 2009/04, though it is not clear if they are period equpment. 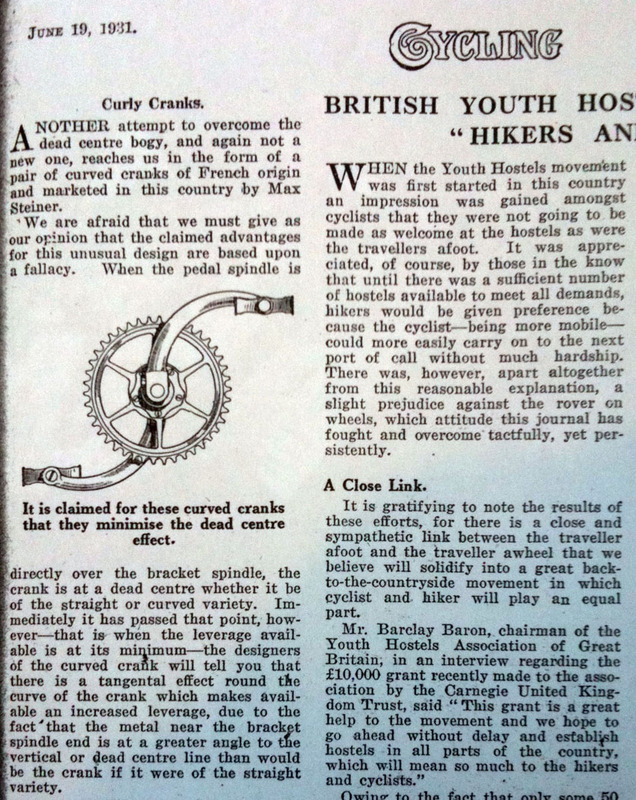 The same page also shows Harry Grant riding with curved crankarms for the motor paced hour record, 1933 — unclear if they are Chandez cranks or something else; presumably these were used in pursuit of performance. 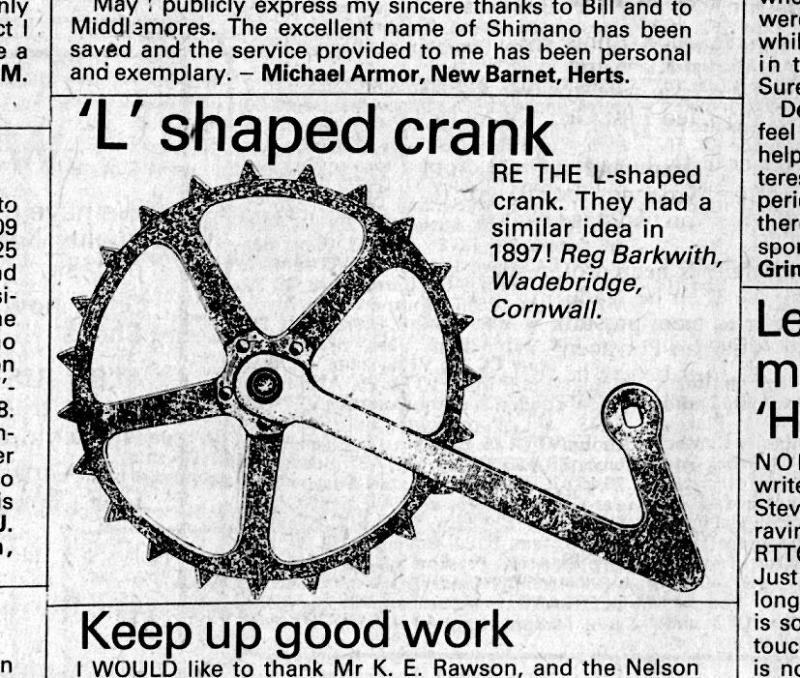 Note thes cranks are "clockwise" while the P.M.P. and T.A. are counter-clockwise. A square taper version was also produced (via Bikeville's Blog). Date unknown. Designed to overcome dead centre; gives fast pedaling action. Adpoted by the World's best sprinters. It is unclear if any were made. Emmepi MP Superfast: Not very bent: Emmepi MP "Superfast" curved crank 172.5 130 BCD, eBay as of 2013/07 (seller pb*bikes). From http://www.retrobike.co.uk/forum/viewtopic.php?f=7&t=13951&start=105 as of 2013/07. Avalon Starlite, ?? : The silver-blue one in the above picture is an "Avalon Starlite". Dunno what is the green crank with "S" logo. Note both it and the Avalon Starlite are bent counter-clockwise, while the Starlite is bent clockwise. T.A. : According to http://www.blackbirdsf.org/ta/other.html as of 2006/12, In the 1960s, T.A. 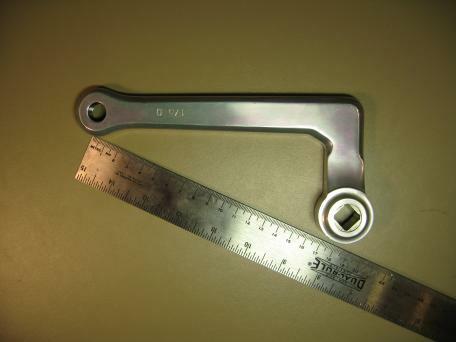 made some L cranks for a 1960's French show bike. Since these were a show bike, it seems most likely they were intended as (and perceived as) art, rather than as some performance device. 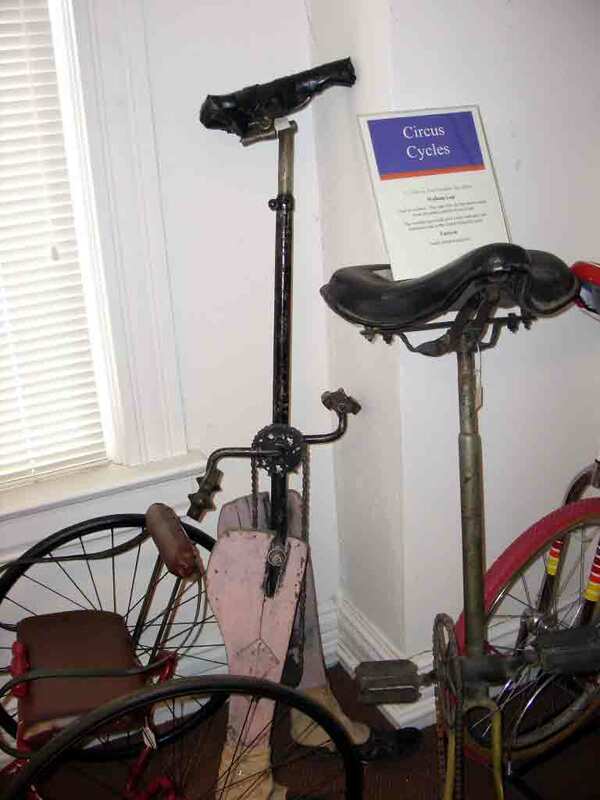 Unicycle: A unicycle with L cranks is shown at http://www.thecabe.com/arc/shows and swaps/2006 Bicycle Museum of America/Unicycle-with-legs.jpg as of 2009/04. The appearance of "legs" on the unicycle suggests the L cranks are for art, not performance. 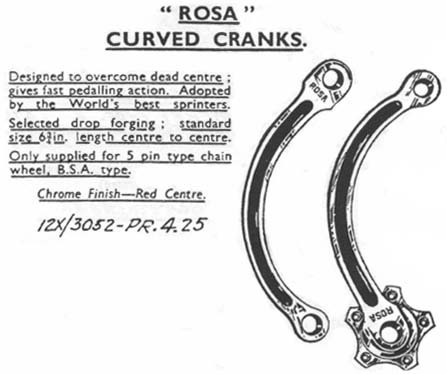 dpardo "sickle" cranks are (were?) offered in both clockwise and counter-clockwise "spiral". Z-Torque™ retains the same basic bad idea of a P.M.P. 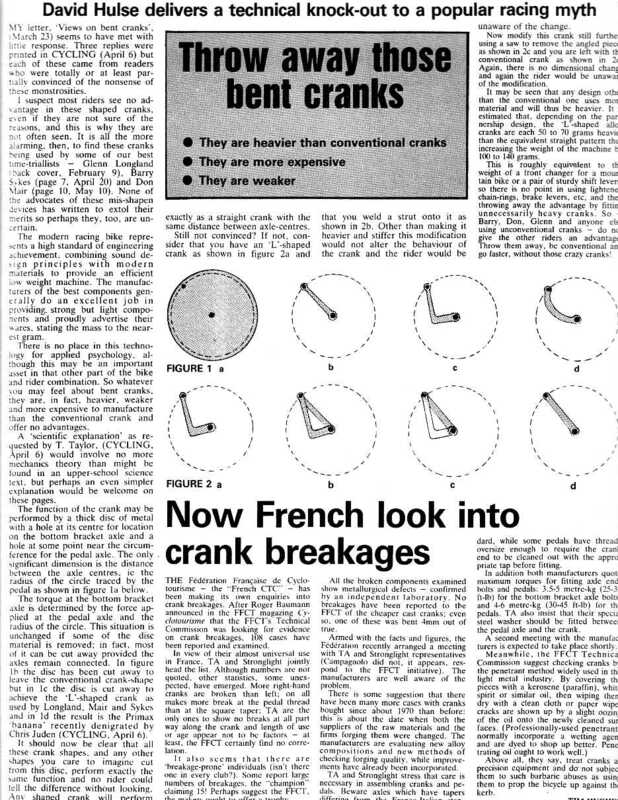 crank, but with increased weight and reduced ground clearance. The P.M.P. crank stands out in part because it manages to take a bad idea and make it worse: the crank spider is not simply bolted to the right arm. 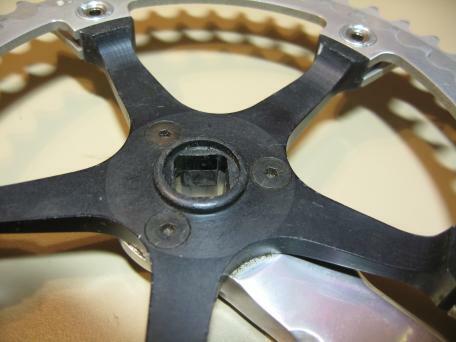 Instead, the spider is about 1/3 of the square taper, while the arm is the other 2/3. This puts a joint in the middle of a highly-stressed joint — so highly stressed that hardened steel spindles sometimes break here, even without a jointed square taper. Probably no P.M.P. 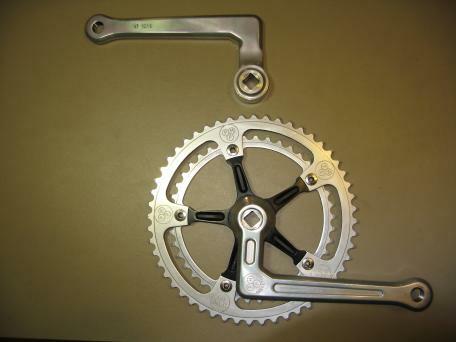 arms failed due to this two-piece square taper; but just as likely few cranks were produced, and most saw little or no hard service before being replaced with something conventional. 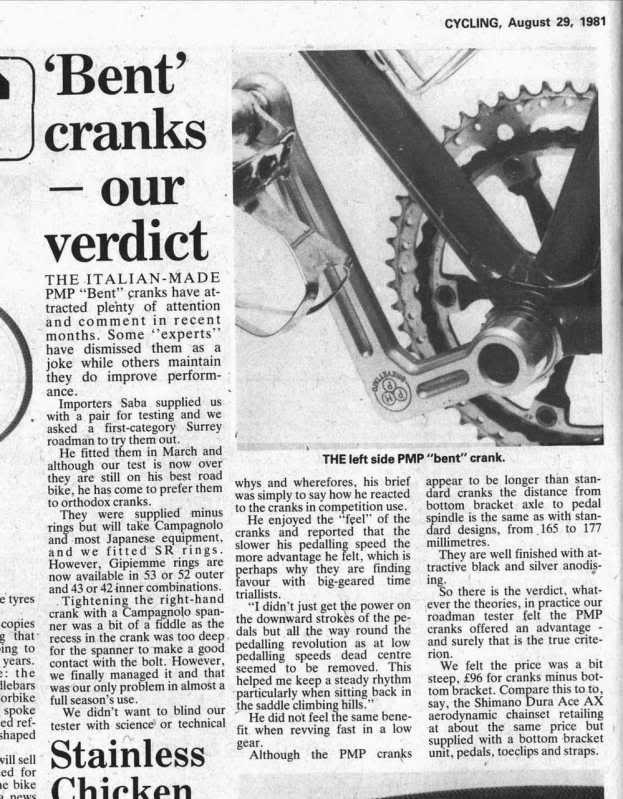 Imagine, the perfection of the PMP crank with it's leverage augmented by right angle crank arms, paired with the scientifically designed bi-centric Polchlopek chainrings? Will such a combination ever occur again? Special thanks to Bob Freeman for this sought after combo!